‘Hot Water’ Is A Wrap! The filming of “Hot Water” wrapped production earlier this month on October 17th. 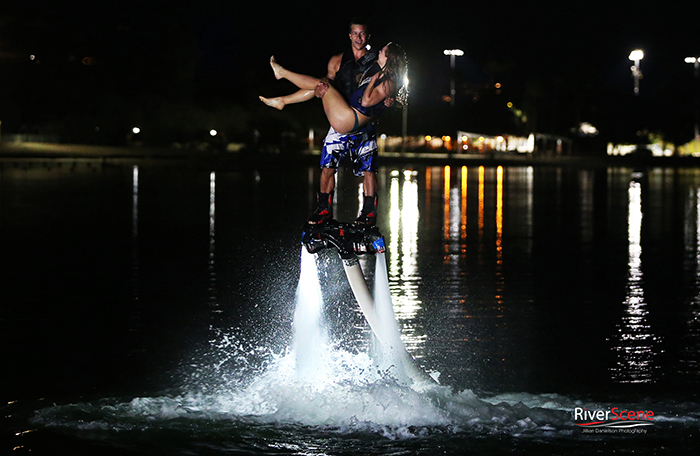 Lake Havasu City local, former-stunt person, and director of the film, Larry Rippenkroeger, officially called the movie a wrap after filming for three weeks. “This dream I’ve had for 20 years. This has been such a rocky road to get here. Somehow, someway, we were able to put it together, the planets aligned. It’s been amazing (to film in Havasu). The support from the city, from the people has been phenomenal. 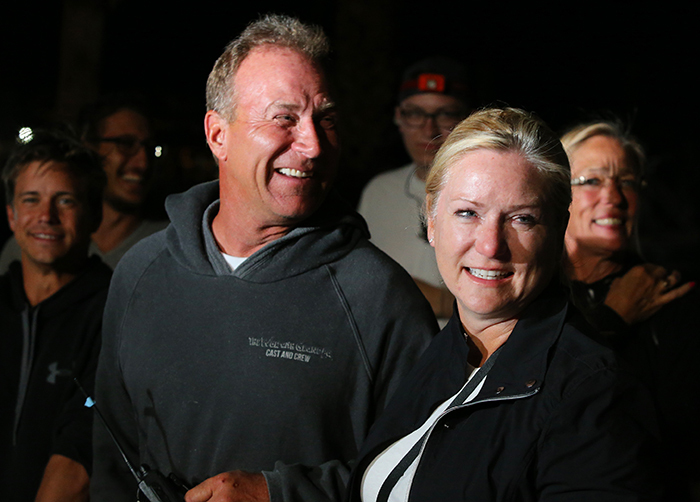 We couldn’t have been anywhere else and pulled this off,” Rippenkroeger said. 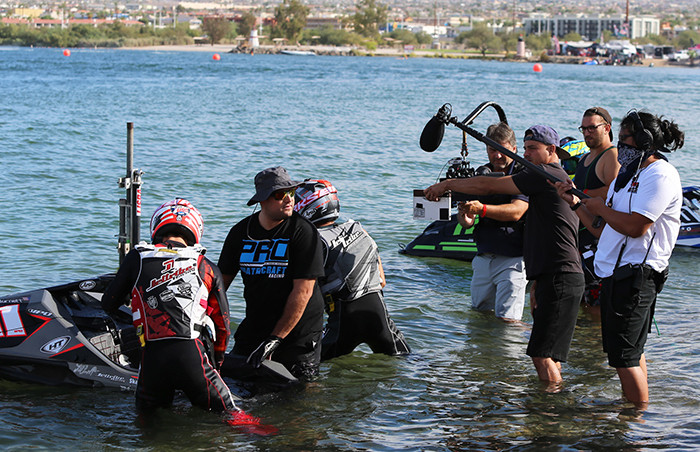 “Hot Water” was almost entirely filmed in Lake Havasu City, with remote racing footage shot in California and Florida. 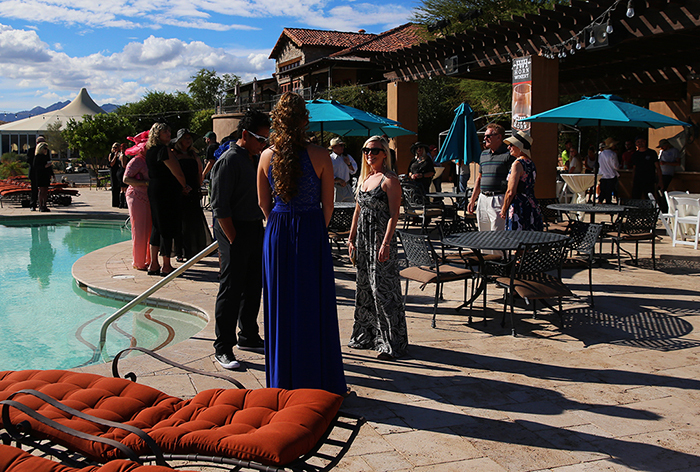 Several locations were used in the film including (formally known as) Springberg-McAndrew Park, Refuge Golf and Country Club , Body Beach, That Beach, Octane Wine Garage, El Paraiso Mexican Restaurant, IJSBA World Finals at Crazy Horse Campground and Rotary Beach. 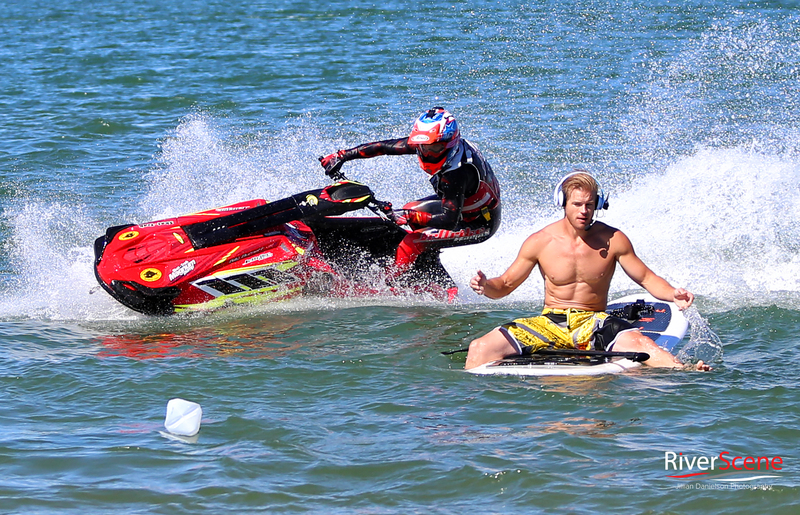 The plot of the film follows an amateur personal watercraft racer hoping to make it big in the sport. With the mentoring of a former world champion and other kooky friends along the way, Billy, played by Glenn McCuen, finds his place in the PWC racing realm. The action-comedy is full of precarious situations, laughs and relatable hopes of a young sport enthusiast. 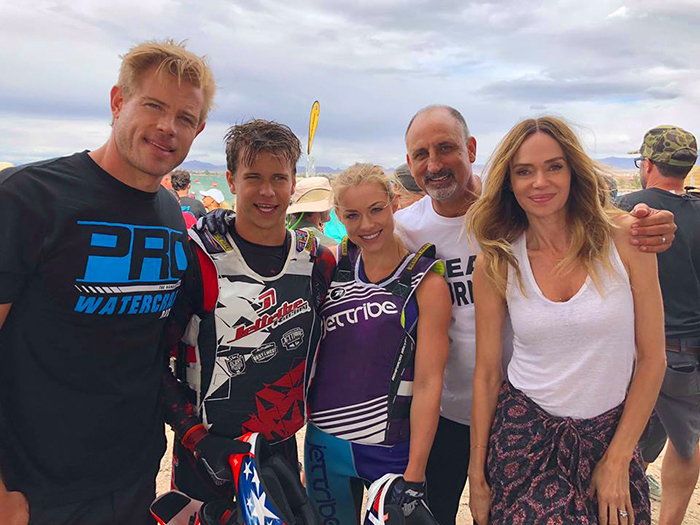 Other cast members of the film are Trevor Donovan (“90210”), Max Adler (“Glee”), Nikki Leigh, Vanessa Angel, Yves Bright, Brian Combs, Michael Papajohn and Stormi Bree. “I’m playing the bad guy, the current world champion when the new guy comes in to steal my crown. The best part for me has been working with all of the pro racers. Growing up, I looked up to all these men and women. When I was a teenager, I wanted to be them. When I got older, that dream went away and my new dream became acting. So, doing this, for me is fulfilling two dreams,” said cast member, Brian Combs. Actor Max Adler also said he had a positive experience filming in Lake Havasu City. “Filming in Havasu was one of my very favorite experiences I’ve ever had in my career,” Adler said. “Waking up every morning to beautiful sunrises, driving on traffic free paved roads, filming around the stunning lake and catching the most gorgeous sunsets every night was something I’ll never forget,” he said. He said he appreciated the support of the city and its residents and would definitely be back. Most cast members are from the Los Angeles area, but nearly all the extras and some small speaking roles were Lake Havasu residents. “Being an extra was a really cool experience. I loved getting to be a part of the behind the scenes actions and getting to see what all goes into making a movie,” said film extra Megan Gagnon. Some crew members are from Lake Havasu as well, including the hair and makeup, wardrobe, art design, background extras, craft services, production assistants and assist film crews. In order to make the visiting cast and crew members feel more welcome, local businesses created complimentary gift baskets that represented Lake Havasu. The cast and crew used these baskets to patron many local restaurants, retail stores, gyms and more. When not filming, the group enjoyed hiking, the beach and exploring the area. “When I have been able to have a day off, I worked out at Havasu Fitness and there is a couple spots I liked. We went to Shogun and Mudsharks which were good spots. And getting all night coffee from the Human Bean. The thing I have enjoyed the most is being on the water, wakeboarding, learning how to ride a PWC which is something I’ve never done before. I loved being outside in nature and next to the water, ” said “Hot Water” star Glenn McCuen. “Filming in Havasu was one of my very favorite experiences that I have ever had in my career. Waking up every morning to the beautiful sunrises, driving on traffic-free paved roads, filming in or around the stunning lake, and catching the most gorgeous sunsets every night was something I’ll never forget. The whole town, all the businesses and people opened their doors and arms to us made us feel so welcome and at home. The time flew by and I cherished the local Lake Havasu support. Can’t wait to get back ASAP.” said “Hot Water” star, Max Adler. Just as any major project, filming “Hot Water” was no easy feat. The cast and crew had to deal with unforeseen weather changes like rain, wind and dust storms. They even experienced a haboob, an intense dust storm that affects places like Phoenix but is rarely seen in Lake Havasu. 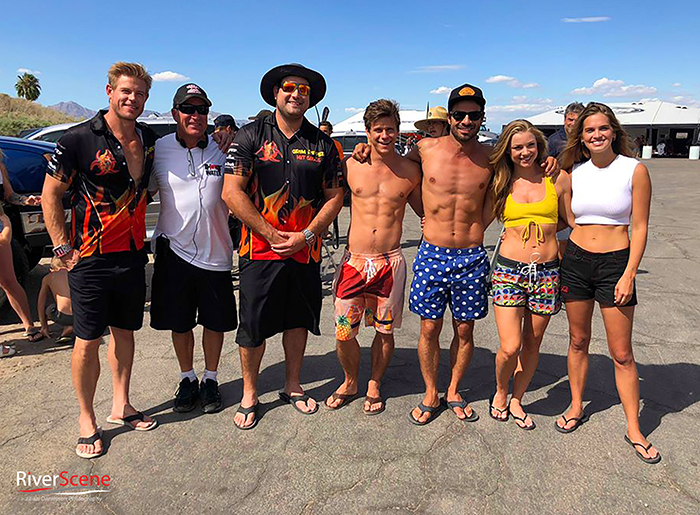 Nonetheless, rain or shine, the cast and crew persevered through their month-long filming session here in Lake Havasu City. “Hot Water” will debut in the summer of 2019. 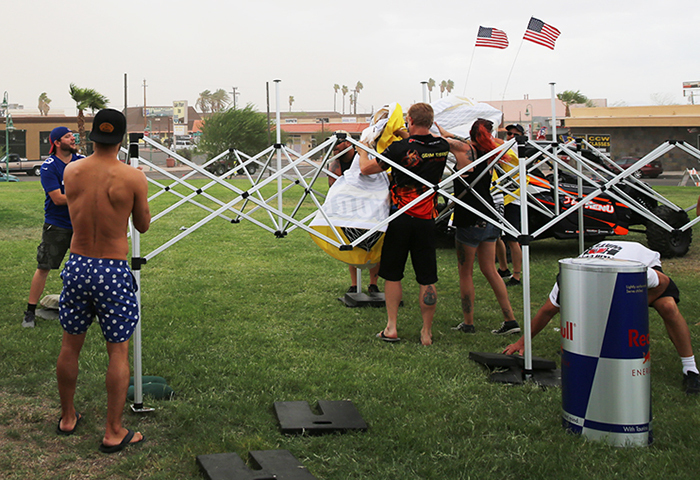 We were in Havasu at Body Beach and at the world finals whilst this was being filmed. Can’t wait to see the finished film. Can’t wait to see this movie.. love stand ups . the smell of race fuel.and the intense feeling of the big show..its unreal..realy..
Been waiting for a movie like this for 20 years ..no joke so so kool.. can’t wait to see it.even if my son was not in it.. I’ still can’t wait to see it..